Last week I completed one of my collection goals. 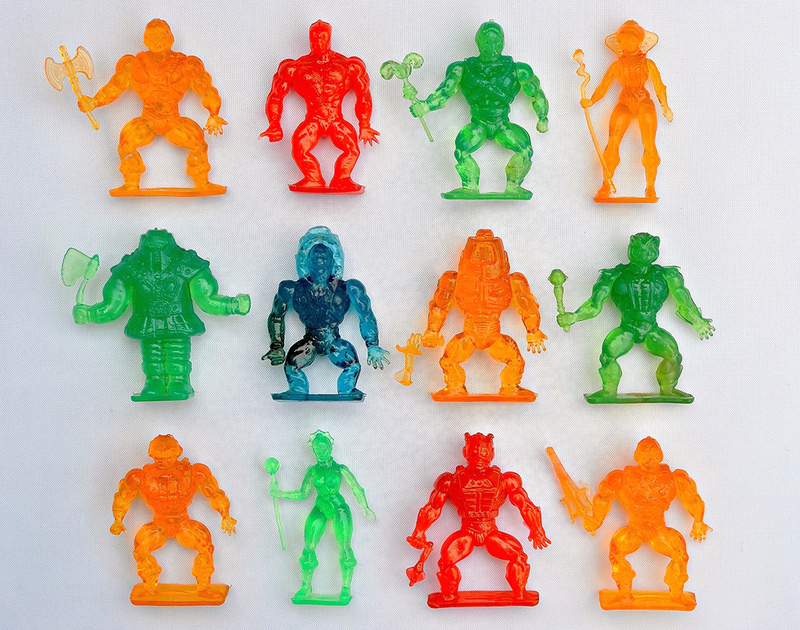 I finished my set of 12 Masters of the Universe knockoff vending mini figures in transparent colors! Check out the whole crew above. I first became aware of these many years ago when I got a green Ram-Man (who was sadly missing his axe) in a lot of random minis off eBay. He was the only one I had up until last year, when I set out to track down more of them. Fast forward to earlier this month, and Man-E-Faces and the He-Man holding an axe were the final two I needed. Thanks to the kindness of another collector and luck on eBay, I got them both within the same week! According to what I have been able to find out online, these guys were sold in the mid-late 1980s in toy vending machines under the name "Warriors of the Universe." It must have taken someone hours to come up with that name in order to not use Masters of the Universe, huh? I actually don't remember seeing these out in the wild as a kid. I'm sure if I did, I would have gone nuts trying to amass as many quarters as possible. These figures are made of a firm-yet-flexible plastic, maybe a bit softer than a MUSCLE figure, but not rubbery like a Monster in My Pocket figure. They're about 1.5" tall. They were also released in a variety of solid, non-clear colors, but I wanted to put together a set of the transparent versions because I think they look cooler. You can argue that the details don't show up as well on clear figures--and you'd probably be right--but man, nobody will ever be able to convince me that a mini figure doesn't get an extra jolt of awesome when it looks like a Jolly Rancher. The clear colors include orange, red, green and blue (if there are others, I haven't seen them). 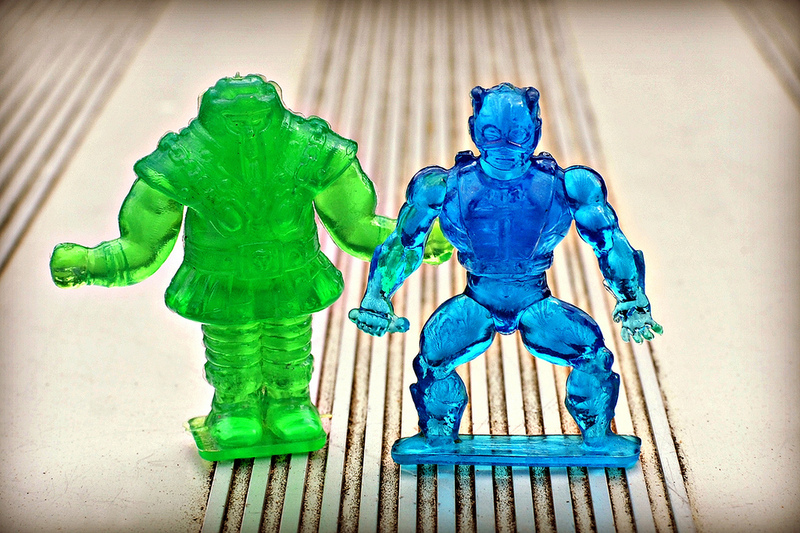 Here's a shot of Mer-Man and Man-at-Arms minis in solid color versions. Interestingly enough, Mer-Man is made out of hard plastic while Man-at-Arms is made out of soft, rubbery plastic. Now that I've finished my clear set, I'll probably try to fill out a set in solid colors. What about you? What do you think of these guys? Do you own any or remember seeing them in vending machines? Those are super awesome! I've got to start looking for them. Yeah, they are really fun in that vending bootleg sort of way. Happy hunting if you decide to start going after them. They do pop up somewhat regularly. These are awesome! It's amazing how big the MotU merchandising was. When you think you've seen it all, you find more stuff outside the official stuff! This really was absolutely HUGE back then, it's too bad I was born in 83, I pretty much miss most of it. Same here. I was born in '84 so I didn't actually have any MOTU stuff in the '80s. But I just love anything '80s-fantasy related. What a coincidence! I just picked up a clear blue Evil-Lyn at a random toy vendor at a show. I spotted her right away amidst the random figures in the bin! Born in '84, I missed MOTU for the most part. Love the clear "Jolly Rancher: (LOL!) types more. These are great! And BTW, you guys are so young! Haha! I was ripe during the MOTU heyday. I was born in '72, so I was about 9 when it all started. No worries! 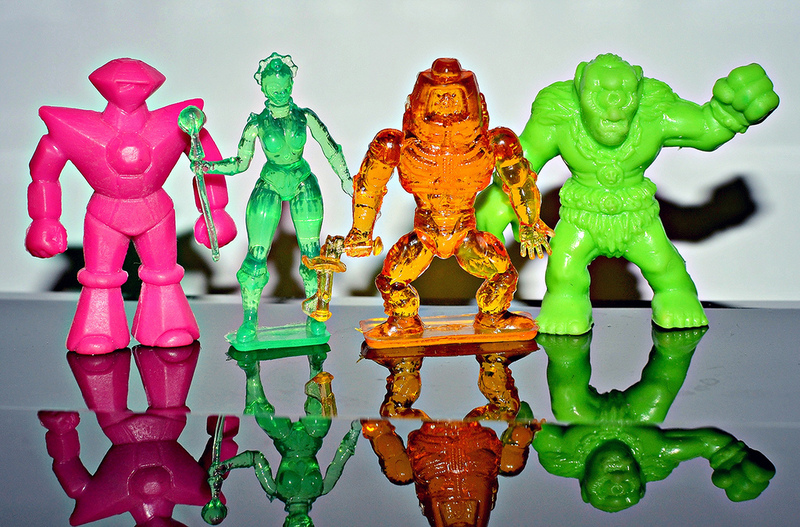 These are fantastic and the translucent ones are the ones I remember as a kid. On the hunt for them. Cheers! Cool. I didn't realize these were ever sold through Oriental Trading. My God, I thought I was the only one who remembered these! I scored a handful of these guys as prizes from my hard-earned ski ball exploits at places like Chuck E. Cheese's and Showbiz Pizza (they currently reside in a shoebox with a bunch of other plastic miniatures at Mom's house). 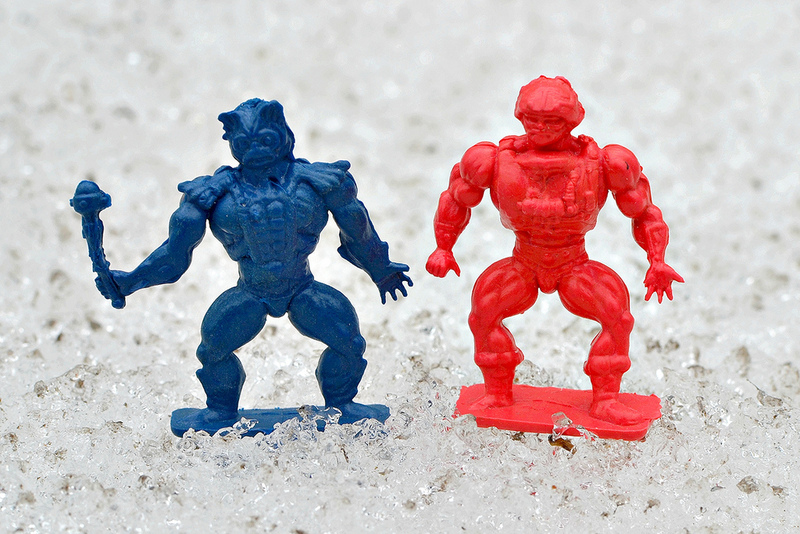 As rabid and knowledgeable as Masters of the Universe fans are, I have never heard anyone make mention of these "little weirdos" on the various toy sites. Thank you for posting these pictures! Fantastic website! Thanks for your comment, glad you enjoy the site!